News arrived in late December from the waters off the United Kingdom that the first of MHI Vestas (a joint venture between Vests and Mitsubishi Heavy Industries) 8.0 megawatt (MW) turbines is now delivering commercial power to Dong Energy’s Burbo Bank Extension. The entire 258 MW project – to be completed in Q1 of 2017 – will need only 32 such turbines. This is a significant milestone, as wind turbines have become increasingly more powerful over a relatively short timeframe. This 8 MW machine is currently the largest commercial turbine in the world. Less than ten years ago, at the original Burbo Bank project, a 3.6 MW turbine was inaugurated, the largest in the industry at the time. These new machines are big. At 113 meters (370 feet), the towers stand 64 feet taller than the Statue of Liberty, while the blades come in at 80 meters (262 feet). This scale recently enabled MHI Vestas to snare the world record for energy production by a turbine in a 24-hour span: 192 megawatt-hours (MWh) – enough energy to power approximately 18 American-sized homes for an entire year. As large as they are, turbine expansions have not yet fully maxed out. The industry is already eyeing machines in the 10-12 MW range in order to future cut costs. And while MHI Vestas is the first out of the block with its deployment of an 8 MW machine, two other manufacturers have 8 MW machines in the offing. 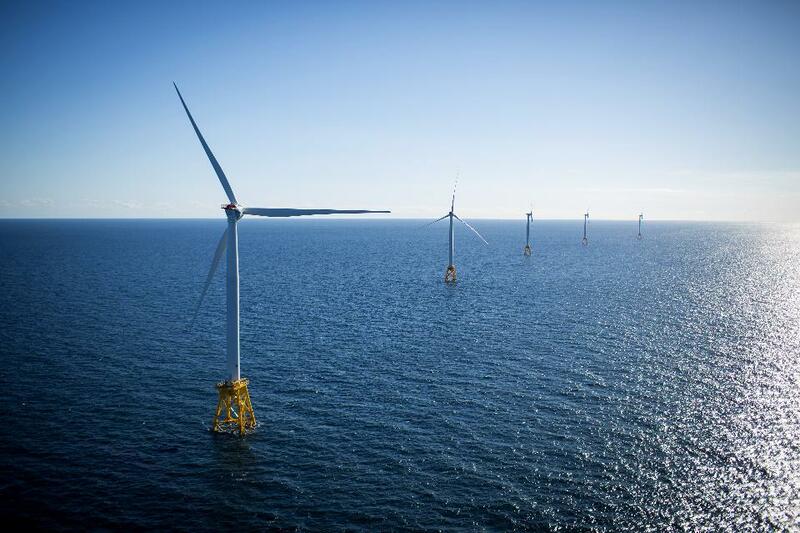 Meanwhile, here in the U.S., Deepwater Wind just energized five of its 6 MW GE turbines. So the big machines are not just limited to offshore Europe. Onshore, the wind turbines are not nearly as large. Many turbines in this country’s most recently built wind farms are in the 1.5 to 2.0 MW range. In part, this is caused by existing terrestrial infrastructure constraints, such as highway bridges that limit the size of towers that can be transported. However, these limitations can be overcome as new technologies are brought to bear, such as taller towers that access stronger and more dependable winds. MidAmerican Energy recently built a 2.4 MW turbine on a 379 foot concrete tower, putting it 100 feet taller than its steel-based counterpart. This monster used 70 truckloads of concrete and 90 tons of steel rebar, and is currently the largest turbine on the continental U.S. Expect more to come. Estimates are that deployment of taller towers can open up vast new areas of the U.S. to wind energy development, particularly the southeastern U.S. For example, an increase in tower height from 80 to 140 meters (from just over 260 to 460 feet) could increase the land area open to onshore wind development by two-thirds, while increasing the economics of existing areas. As technologies continue to advance and economies of scale result in bigger machines delivering energy at lower costs, we should expect to see even larger wind turbines towering over landscapes and oceans, pumping clean electrons into power grids in the U.S. and across the planet.